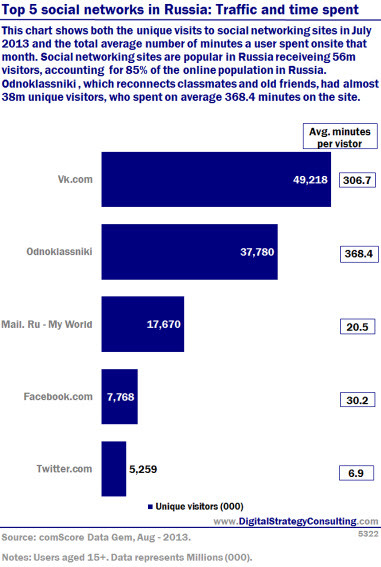 Entries from Digital Intelligence tagged with "odnoklassniki"
This chart shows both the unique visits to social networking sites in July 2013 and the total average number of minutes a user spent onsite that month. Social networking sites are popular in Russia receiving 56m visitors, accounting for 85% of the online population in Russia. Odnoklassniki, which reconnects classmates and old friends, has almost 38m visitors, who spent on average 368.4 minutes on the site. Russians are the heaviest social networkers worldwide in terms of time spent per user, while Brits hold the fourth spot, according to a new study. The data, from comScore, found that in August 2010, 34.5 million Russian internet users (74.5 percent of the online population) visited at least one social networking site. With an average of 9.8 hours per visitor during the month, Russians spent more than double the worldwide average of 4.5 hours per visitors on social networks, ranking it #1 among all countries in social networking engagement.